All, or most, female birds will produce an egg at some point in their life, usually at a younger age when they can produce lots but birds can lay throughout their lives. This is a very natural thing for a bird to do and shouldn't be anything to worry about. However, problems can arise when a bird starts producing eggs, and this article is intended to help owners spot the signs that something is wrong. I have seen a lot of people totally confused when their single female bird suddenly lays an egg. A bird does not need a mate to lay an egg. The difference is that the egg laid by a single female bird will not be fertile, whereas a female that is part of a pair can lay a fertile egg. A simple way of understanding why a single female produces eggs without a male present is to compare the situation to humans. Each month, women go through a menstrual cycle but don't get pregnant unless, of course, they have been fertilized by a male. The same applies to birds, which can cycle without producing a fertile egg. A cycle will usually result in an unfertile egg. During the time when a female bird produces eggs, changes happen in her body that will need an aware owner to help with. An egg is made when yolk is released from the ovary into the oviduct, where it will take 3 weeks or so for the body to form a hard shell around the egg and expel it. This hard egg shell takes a lot of calcium to form, and a cycling bird will need plenty of extra calcium in her diet to help her do this. If a cycling bird does not get an adequate supply in calcium, it can result in her eggs being deformed, soft-shelled eggs and hypocalcaemia, which affects her bones. Extra calcium can be given to your bird in the form of a good supplement, like Zolcal, which contains vitamin D3. D3 enables the bird to absorb the calcium, and a bird usually gets a good supply of D3 through natural daylight. This is why it is always a good idea to place your bird's cage where it can receive natural light (not too much direct sunlight), so your bird can get its own supply of D3. Cuttlebone should always be made available for your bird, but contrary to what people say, it isn't a good enough source of calcium to be relied upon, especially during cycling. You can feed your bird crushed up egg shell, egg food, and egg biscuits to aid with calcium supply. When a bird is cycling, you may notice that she is more active and playful than normal, showing affection towards her toys or you and regurgitating seed as a sign of affection towards the favorite toy or to herself in a mirror. She can seem incredibly excited when at play, and a clear sign that she is cycling is when her tail goes up vertically, accompanied by soppy, fluffy eyes (increased white rings around the eyes). This is when the bird ovulates, and she usually does this during mating with a mate. If there isn't one, she will do it to you or her toys. You may also notice her increased appetite and a slight weight gain, which is her conditioning herself to lay. She will try to prepare a nesting area. You may find her sitting in the seed bowl and kicking out all the seed or shredding up paper on the bottom of her cage. She may even fancy the wall paper as a nesting material and start stripping it off! I will now explain the problems that can happen to a cycling bird, what can cause them, how to spot them, and what to do if they occur. Egg binding is when a bird produces an egg and cannot lay it. There can be various reasons for the occurrence of egg binding. Egg binding is very serious, and an avian vet must be consulted right away if you suspect your bird may be egg bound. Sitting on the floor a lot. She may sit on the floor lots to lay, but if she is there all the time for long periods of time, she may be having problems. Excessive straining. You may notice her contracting in the stomach area and panting/breathing heavily. This is a sure sign that she is in trouble. Visual clues, such as a large swollen looking area around her vent. You will see this whether or not the bird is egg bound if she has an egg, but if it is very obvious and she is not passing it and it is there for a long time, she will be having problems. Larger droppings. The presence of the egg in the oviduct means that there is less room for the bird to pass droppings, and you will notice that your bird goes less frequently. When she does go, you will see her straining hard, and a huge dropping will come out. These big poops can be unbelievable large, like the mass of 10 regular budgie sized poops, the sort of size you would expect from a larger parakeet/parrot. The bigger the poops get, the closer the egg is to the cloacae, where it is due to be expelled. If they are huge for days, your bird is likely to be having trouble passing that egg. Why is egg binding so serious? Egg binding is a serious condition that will almost certainly result in death if an avian vet is not consulted. The reason that it is so fatal is because of the pressure an egg can put on the surrounding organs. 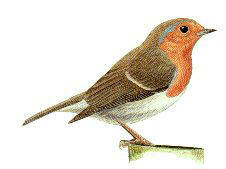 A bird has all its organs stored in such a small area, as the body cavity of a bird is so small. An egg that is inside a bird for too long can put pressure on the kidneys, liver, and nerves. Pressure on the kidneys and liver can stop them from working properly, resulting in increased toxins in the blood that can cause death. This is why it is such an emergency. Another problem caused by a prolonged egg in the oviduct is nerve damage. The pressure can kill nerves leading to the feet and legs, which can paralyze all or part of the leg or feet/claws. The photograph is of my budgie after egg binding killed the nerves to her claws on her left foot, and she can no longer get around so easily - she can't spread her toes out on a flat surface. If you are unable to get your bird to a vet straight away, there are small things you can do to help your bird. Heat will help the muscles in the oviduct wall contract, and it is a good idea to keep your bird warm by placing a heat pad under the cage floor where she is sitting so that the bottom heat can help her. DO NOT put the heat mat inside the cage itself, as you don't want to burn or overheat your bird, especially if she is unable to move. The heat pad must be secured to the underside of the cage and only on one side to create a thermal gradient - a warm end and a cold end. I have heard people say that applying a lubricant to the vent and massaging it helps the egg pass. I personally do not think that this help, and does nothing but give the bird an oily vent, but I can't say for sure that it doesn't work. 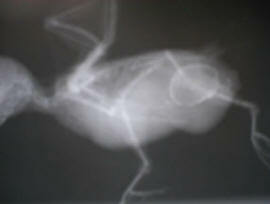 When your bird gets to the vets, an x-ray will be taken to confirm the egg binding. This picture shows my budgie Jo's initial x-ray, where you can clearly see the huge, deformed, and over-sized egg that she couldn't pass. Your vet can then treat your bird by keeping her warm and giving her fluids, antibiotics to prevent infection from the egg, and a drug like Oxytocin that encourages the contractions needed to pass the egg. Your vet may also find it necessary to insert a hollow needle into the egg and drain the contents to relieve the pressure on the surrounding organs. Your bird should then pass the shell on its own with the help of the drugs. Failing that, surgical removal may be necessary. Egg binding can be caused by a few different reasons. General unfitness can cause it. If a bird is unfit, overweight, and doesn't get enough exercise, the muscles may not be strong enough to expel the egg. This is common in birds that are fed solely a seed-based diet, in birds who are never allowed to exercise by being kept in their cage all day, or in birds that are clipped and cannot fly (though clipping is recommended for safety). Remove any toys that she may have an attraction to, and try not to stroke her back when handling, as this can cause her to feel fruity. I had to remove my bird's hanging bell toys because she would use the hanging bell as a stimulant by walking under the bell so it brushed against her back, followed by her tail going up vertical. If you know that your bird is prone to egg binding, it is best to discourage any kind of nesting behavior. Reduce her daylight hours, give her less fattening treats like millet, and remove any nesting materials that she may have from her cage. Calcium, as I mentioned before, is very important in a cycling bird, and I cannot stress enough how important it is that they get enough. A lack of calcium in a cycling bird can cause soft-shelled eggs to form in the oviduct that the bird cannot push out. Also, the muscle action needed to expel the egg can be weak without adequate calcium. She will start using her own body's supply of calcium to make eggs if she isn't supplemented enough, which can make her bones weak, fragile, and easily breakable. She will get generally weaker and weaker, eventually resulting in death if she keeps using her own calcium, so you must remember to supplement her when she is cycling. I also believe that the age of the bird is relevant to egg binding, as an older bird who is less fit will find it harder to pass an egg. An older bird will need more calcium to support her in general, so an older bird that is using calcium for general bone support and egg-making is very likely to have problems with egg binding. 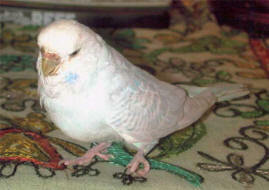 My budgie Jo was 10 years old when she produced her first egg and became egg bound. Egg peritonitis is another condition related to egg production that can be fatal to your bird. It is caused by yolk fluid leaking from the oviduct and ovaries into the abdominal cavity. The fluid can build up there, causing a visible swelling of the abdomen. From there, the yolk can get into the blood stream and poison your bird, and it can get laid down in the liver, causing an enlarged liver and liver damage. This picture shows Jo's swollen body when she had egg peritonitis. It makes her preen gland stand out because the area behind is swollen. Egg peritonitis can make your bird very sick and is difficult to treat. It has much better results if caught early. There are good treatments now around for egg peritonitis and some birds do make a full recovery. Treatment involves using a diuretic like Frusemide to clear away the fluid and drugs like Milk Thistle to help the liver repair itself plus antibiotics to prevent further infection. Symptoms are very similar to egg binding, with the swelling, the large poops, and panting. The difference is that a bird with egg peritonitis will not put on any extra weight like an egg-laying bird and the swelling will be more internal. An egg can be felt as a solid swelling by the vent, and the swelling from peritonitis isn't so solid to the touch. It is visible by making the bird look bloated in the abdomen and vent area. Your bird may sit on the floor a lot with her tail up vertically against the side of the cage for comfort from the swelling. She may spend time on the floor, without all the nesting behavior she will display if she has an egg and sleep like that, with her tail up vertically. Her behavior prior to this can be just as fruity with the toys, as if she was cycling an egg. Her droppings may appear with a whitish yellow in the regular dark green coloring and be large, again from the swelling inside. It is very hard to distinguish between egg binding and egg peritonitis unless you have experience and even then, an x-ray is always done to be sure. I have taken my budgie so many times to my vet thinking that she had another egg stuck inside only to find that she had egg peritonitis. The purpose of writing this article was to help bird owners understand why birds can become egg bound, to help spot signs, and how to help prevent it. I would like to finish off by stressing that if in doubt or if egg binding is suspected, call an avian vet right away for advice and get your bird seen as soon as possible. Time is always of the essence when birds get sick, and the sooner these things are caught, the better the success of treatment for your feathered friend.